Three successive weeks of quality training. Time for some R&R and a cycle wrap-up ride. I traveled to Austin for the weekend. 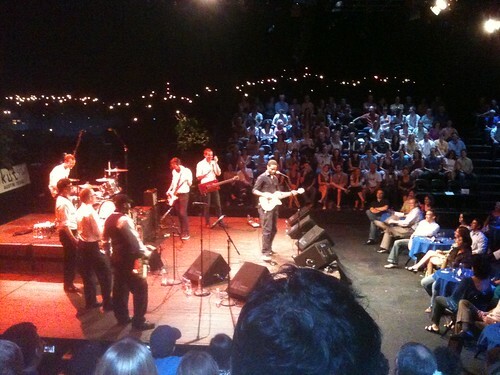 Friday night I saw Black Joe Lewis and The Honeybears at the KUT fundraiser with Jane. Having never seen them before, this was Jane's idea. And a good idea it was! Thoroughly enjoyed the show. Nice blues/soulful rock vibe but still having a raw cutting edge you can only get with a local talent playing a great venue. Even the white folks got up and shook themselves. 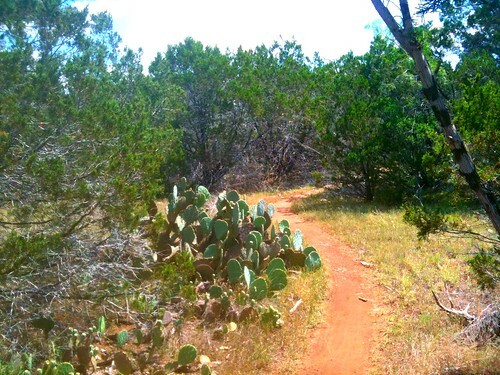 Saturday saw my hide at Pace Bend Park for a tempo-paced ride to capstone the weeks' training. After the recent TMBRA race I heard lots of bemoaning about the difficult of riding here. I start out a bit initimidated. 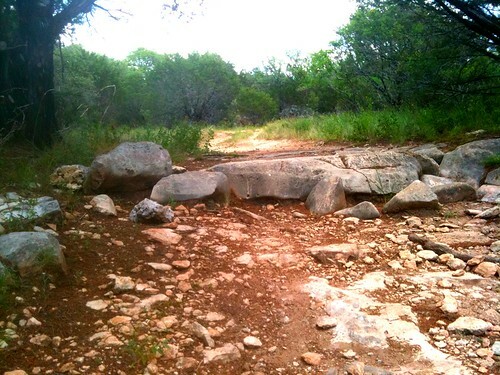 But I ride a couple of rock garden descents and feel quite comfortable. Turns out those descents were the hardest thing out here. Total confidence boost. Great place to ride! I don't know what the race route was. I can envision a really super connect-teh-dot path through the network of trails that would be absolute torture. But.. I can also envision one that would be really trivial. I'm sure race day was some of both. And not as difficult to ride as some made it out to be. I'm riding strong right now. Possibly as strong or stronger than ever. The motor is running good. I do OK with the heat. I tackle the techy stuff adeptly. I don't baby the elbow -at all. In fact, I actually try to wheelie hop and beat the arm up as much as I can today. It's the only way it's going to get stronger. These trails require a lot more upper body effort than I'm used to. By the end... its getting tender, and clear I need to cut the 3-1/2 hour goal a bit short. Sunday began a recovery cycle. To kick it off... a Gordough's donut. This was a Funky Monkey. 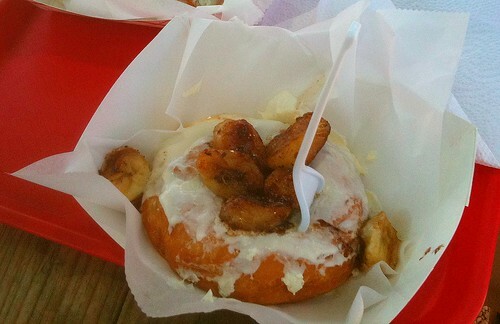 Brazed bananas with brown sugar and cream cheese icing on top of a large, warm, freshly made donut. Masterpiece! I wish I could make donuts like this at home. I'd never leave. Some heavy-duty napping and a return home completed the weekend. The upcoming week includes a recovery cycle. I'm starting to get that snippy streak that accompanies a heavy training regimine. And the last few days of last week had my mind wondering about all the other things I could be doing besides training. Truthfully, there are a lot of domestic tasks and errands that I've been neglecting. It's time to step away for a few days. I ran myself into the ground in last summer's heat. Easy to do in the Gulf Coast heat. (Today's HI=105°F).